Director Jon Favreau has tackled all manner of genres—mob, comedy, Christmas, family, superhero, board game--in his brief directorial career, but in his latest film he's confronted by two of films most enduring tropes, sci-fi and Western, a combination that finds him overmatched. 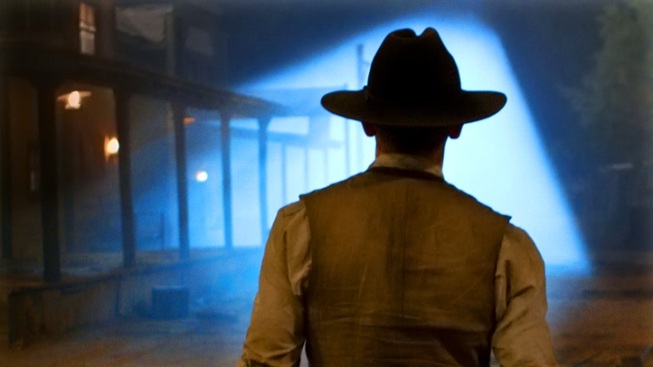 "Cowboys & Aliens" is a great idea teased out into a so-so story, which is only barely propped up by a superb cast. Daniel Craig stars as a Man With No Name (at least until he learns his name). The film opens with him awakening in the middle of the desert, short of breath and wounded, a strange bracelet affixed to his wrist. He soon learns he's a wanted man with a dead or missing girlfriend and that the thing on his wrist is powerful weapon. In classic Western form, the film finds a number of parties at cross-purposes or with serious beefs (beeves?) with one another. But when there are alien ships zooming down from on high, plucking people off the face of the planet, folks can learn to set aside their differences pretty quickly. Harrison Ford's grizzled old grump routine works far better in C&A than it did last winter in "Morning Glory," but as in that romcom, Ford again has a soft fuzzy underside. But Favreau's greatest stroke of genius is the casting against type of both Sam Rockwell and Paul Dano, the former as a clenched barkeeper, the latter as a loose-cannon ne'er-do-well. In fact, the whole cast is stacked, with Adam Beach, Clancy Brown and Walter Goggins all turning in typically good performances. It's odd how flat and bland the film looks, despite having at its command the old west landscape and the infinite possibilities of extra-terrestrials. The scenery is too washed out and grey, and the monsters fail to pop. The whole idea of cowboys facing off against aliens is a great one. In fact it's hard to believe it took so long to get onto the silver screen. But there's no magic—you'd think with the Old West and Outer-space at your disposal, the mixing and matching should lead to some stunning visuals and ideas, but no. And the story is a bit of a mess, too much doesn’t make sense, there's an unnecessary subplot or two… time and time again, Favreau distracts us from the battle at hand. Daniel Craig On "Cowboys & Aliens"
Daniel Craig talks about working with co-star Harrison Ford in their new movie, "Cowboys & Aliens." Also, he explains why he was "deadly keen" to make this film. Plus, how do the stunts in this movie compare to the James Bond films?